Many albatross species are in trouble and need our help. Commercial fishing practices are considered the greatest threat to the survival of many albatross species. Other threats include loss of habitat, introduced predators, eating or becoming tangled up in plastic, oil spills and climate change. Some species are critically endangered. The wingspans of the wandering albatross can reach up to 3.5 meters (11 ft). Albatrosses are large flying birds that spend most of their life on the sea. Albatrosses use their morphologically adapted wings and large wingspans to travel long distances without using muscles. Instead of flapping the wings, they use specialised gliding techniques to minimise the use of muscles and energy. 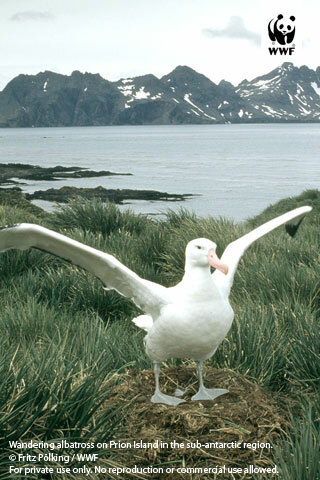 The wingspans of Wandering albatrosses can reach up to 3.5 metres (11 ft). This is the largest wingspan of any bird. An albatross can live up to 60 years and in that life time it would have travelled millions of kilometres. They attain sexual maturity at around 5 years but usually breed when they are 7 - 10 years old. Where do you find albatross? Most albatrosses are found in the Southern Hemisphere: Antarctica, Australia, South Africa, South America. Only 3 albatross species are found exclusively in the North Pacific (Hawaii, Japan, California and Alaska): the Short-tailed albatross, Black-footed albatross and Laysan albatross. Waved albatross is an exception that breeds in the equatorial Galapagos Islands and feeds in the South American coast. They prey by snapping up food that comes up to the surface of the sea. However, albatrosses can also dive into the water. 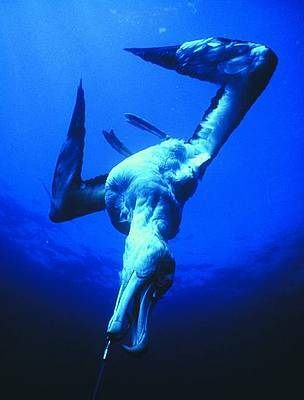 Some albatross species can dive well below 5 metres deep to get to their food. What are the main threats to albatross? Bycatch poses the biggest threat to almost all albatross species. 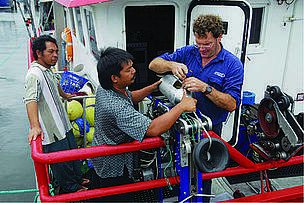 They dive for the fish bait used on longline fishing before it sinks into the sea, get entangled on the hook and drown. 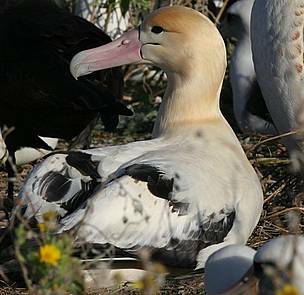 Albatrosses breed on remote islands forming large colonies. However, such spaces are reducing due to the impact of invasive species. Rats prey on the eggs in albatross nests and rabbits can quickly destroy a nesting area with their burrows. Read more about the impact of invasive species on Macquarie Island, a World Heritage Site in the Southern Ocean. Albatross chicks choke on our waste. Every year tens of thousands of albatross chicks on the Midway Atoll in the Pacific Ocean die because they choke or are poisoned by plastics and other human waste that their parents mistakenly feed to them. The work of photographer Chris Jordan chillingly illustrates the results of this plastic diet on albatross chicks (images may be disturbing). The short-tailed albatross or Steller's albatross, (Phoebastria albatrus) was almost hunted to extinction due to the market for its feathers. It is now listed as Vulnerable by the IUCN's Red List. Albatrosses are a priority species. WWF treats priority species as one of the most ecologically, economically and/or culturally important species on our planet. And so we are working to ensure such species can live and thrive in their natural habitats. A Wandering albatross is hooked on a longline. To stop the further decline of seabird numbers including the albatross, WWF is part of the New Zealand based Southern Seabird Solutions, which unites fishers, industry, government and WWF in the common cause of saving seabirds by reducing incidence of bycatch. WWF's International Smart Gear Competition identifies real-world fishing solutions that allow fishermen to fish smarter while helping to maintain ocean health. After many years of close cooperation between WWF and the government of South Africa, the 4th largest marine protected area in the world was established in the Southern Ocean. The 180,000 square kilometre area is home to 5 species of albatross. 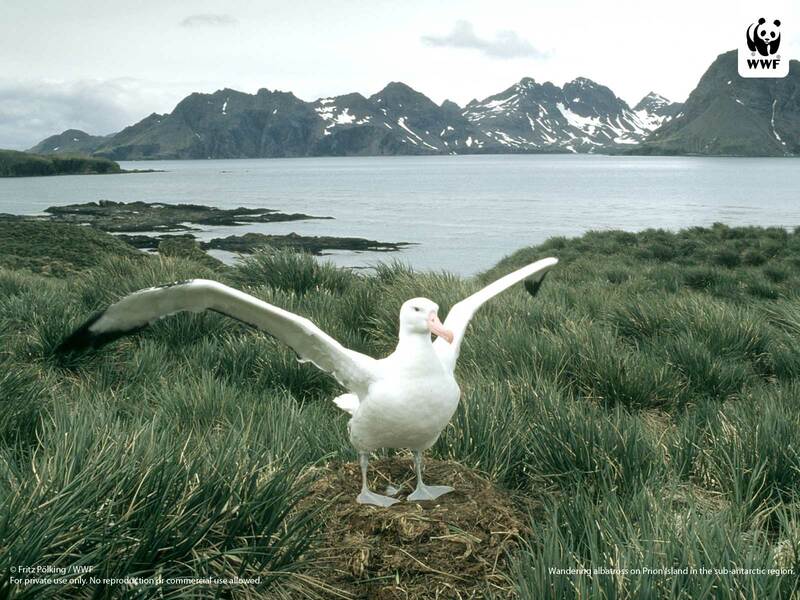 WWF also works to rid islands in the Southern Ocean of pests such as rats, rabbits, and mice. 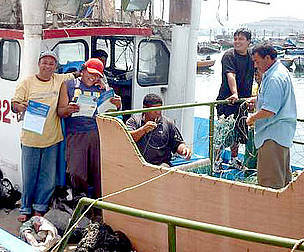 Spanish language factsheets give South American fishers valuable info on seabird-safe fishing practices. The materials are a joint effort between Southern Seabird Solutions Trust and Pro Delphinus, with support from WWF-New Zealand. WWF International Smart Gear Comptetition winner will be awarded $30,000 grand prizefor a fishing gear innovation that could save thousands of seabirds from dying accidentally on longlines each year. Bycatch is a problem that effects milions of seabirds along with sea turtles, sharks, dolphins, whales, and fish. Buy seafood that is clearly marked as sustainable. Dispose of your waste responsibly so that it does not end up in the sea. If you can recycle then do so. If not, ensure that plastics and other waste go in the garbage and not down the drain. Please send us comments about ways that we can improve the content on this page. Albatrosses are so efficient in their flying technique that they spend more energy in landing and take-off than in flying. They spend over 80% of their life at sea, visiting land only for breeding. Male and female birds form a pair after ritual mating dances and this bond lasts for their lifetime togetther. Albatrosses can travel at speeds of up to 130-140 km/h. In the poem The Rime of the Ancient Mariner by Samuel Taylor Coleridge, the albatross is considered a good omen by sailors and to kill one will result in being cursed. For more information (e.g., population size & distribution) of threatened albatross species, follow the links below to the IUCN Red Lists data.